Frank volunteered for active service during Operation Harvest, the IRA 1950s border campaign. With training/recruitment officers interned or on the run, he enlisted in the British Parachute Regiment to get basic military training, deserting from it before his unit was posted overseas to Cyprus. In 1963 Cathal Goulding, the Chief of Staff of the IRA, appointed him OC for the Dublin brigade. He held this position until 1965 when he was court-martialed in his absence and dismissed from the IRA. He was accused of setting up a new revolutionary movement. Like many of his generation, Frank migrated to London in search of employment where he worked as a television service technician. He subsequently became involved with the Irish Workers Group, an organisation openly declaring itself Marxist, and which included Trotskyist activists. Among these was Gery Lawless, a former IRA activist who had taken a successful court case against internment in the South during Operation Harvest. The Irish Workers Group aimed to mobilise the Irish working class to overthrow the existing Irish bourgeois states, destroy all remaining imperialist organs of political and economic control, and establish an all-Ireland Socialist Workers Republic. (1) Frank was attracted to the Trotskyist elements within the IWG. On his return to Dublin he became the National Organiser of Saor Éire, which was set up in 1967 by former members of the Republican Movement and Irish Trotskyists militants. This new organisation favoured the creation of an all-Ireland workers’ republic and tried to overcome the republican schema in which a military organisation and political organisation worked closely together but the military organisation called the shots, as in the IRA/Sinn Fein relationship. Saor Eire, in contrast, was an armed political group; it carried out both political and military functions. This new group would commence expropriating funds from Irish banks carried out roughly a dozen meticulously-planned bank raids. For instance, following a raid in September 1969 on the Northern Bank in Kells, Co. Meath, Saor Éire issued a statement claiming responsibility for the robbery and stating that the money would be used to finance a movement which would strive for the Workers Republic. Frank and another Saor Eire member, Simon O’Donnell, were arrested and charged with another raid – this time on the Hibernian Bank in Newbridge, County Kildare when three armed raiders escaped with £3,474 of bank cash. The state, however, did not have enough evidence to convict Frank and Simon, so they were released under nolle prosequI. On another occasion, shots were exchanged with the cops when activists threw two petrol bombs into the Fianna Fail (government party at the time) Headquarters in Dublin, setting the premises on fire in an attempt to burn it down. Frank was sentenced to six months in prison for the attack. Though often overlooked, Saor Eire was involved in tenant and industrial disputes, such as the explosion at Dalton Supplies in Bray, during an eight-month-long strike over union recognition. On another occasion an explosion demolished a boundary wall that divided a residential area and a working class housing complex in Ballymun, Dublin. When the situation in the North of Ireland erupted in August 1969, Frank and his comrades participated in the defence of the northern nationalist working class population. In April 1970, Garda Richard Fallon was shot dead during a raid at the Royal Bank, Arran Quay, in Dublin. The Special Branch released the names of seven men connected with Saor Éire to the newspapers including Frank whom they wanted to question. Frank sent a letter to the Irish Press, putting his right thumb print beside the signature on the bottom of the letter for authenticity. He stated that this particular case was an attempt by the police to scapegoats Saor Eire activists. Shortly after this he moved to London to avoid arrest, but was apprehended by the British police and spent a year in Brixton Prison during appeals against the Fianna Fail Government’s extradition proceedings. Although Frank pointed out that he was accused “without any evidence whatsoever by the Irish Special Branch”, an extradition order was granted and he was returned to Dublin and kept in solitary confinement in Mountjoy Jail, awaiting trial. 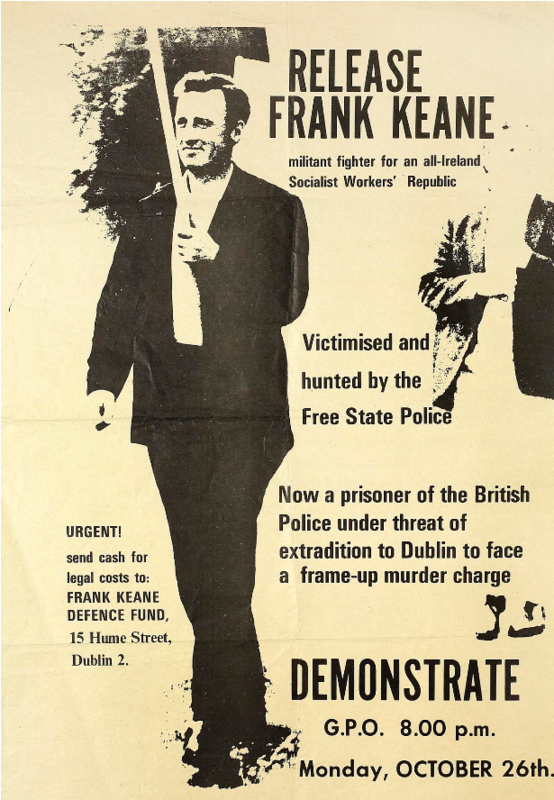 To publicise the case and gather finance for the legal defence, a Frank Keane Defence Committee was set up in London by Sean Matgamna and Liam Daltun. Members of the Young Socialists and the League for a Workers Republic held demonstrations and pickets in Ireland. Frank was subsequently charged with killing a policeman during the bank raid and was tried in the Central Criminal Court. He was the first person on a charge of capital murder since the Criminal Justice Act 1964 abolished the death penalty for murder (except for killing a member of the government, a Garda or a prison officer). Showing the threat the state regarded him as, Frank was re-arrested inside the court after he was acquitted of capital murder. He was then charged with an armed raid in Rathdrum, Co. Wicklow, on February 20, 1970 and with possession of firearms. Frank became one of the first people to be tried in the no-jury Special Criminal Court in Dublin, but again was acquitted. With the untimely deaths of Saor Eire’s Peter Graham and Maìrin Keegan, who established the Irish section of the Fourth International, the tragic death Liam Daltun, and the imprisonment of other key figures including Frank, the organisation ran out of momentum. A criminal element also attempted to fasten itself to the organisation to try to benefit from the bank-raiding skills. Frank and other members in Portlaoise prison then issued a statement, certifying their resignation from SE as they believed it had “ceased to play a progressive role” in May 1973. Frank began to get his own life back together, after 20 years of hectic revolutionary work. He married Jackie Barry, who as a small child had toured Ireland with her mother and socialist Peadar O’Donnell, seeking support for the Spanish Republic. In 1997, Frank delivered the graveside oration on the 25th anniversary of the death of Mairin Keegan. In recent years he has taken part in the anti-water tax /anti-austerity demonstrations in Dublin and attended the 2017 commemoration for Peter Graham. Posted on February 18, 2019, in Border Campaign/Operation Harvest, Civil rights movement, Commemorations, Economy and workers' resistance, Fianna Fail, Frame-ups, Free State in 1920s, 1930s and 1940s, General revolutionary history, Historiography and historical texts, Imperialism (generally), Ireland and British revolution, Mairin Keegan, Partition, Peter Graham, Prisoners - past, Repression and resistance in 1970s and 1980s, Repression in 26-county state, Republicanism 1960s, Republicanism post-1900, Revolutionary figures, Saor Eire, Secret police, Uncategorized, Unionism, loyalism, sectarianism. Bookmark the permalink. 2 Comments. There were two Frank Keane defence committees. mercifully not by different, rival groups but one in London and one in Dublin. The first one was the London one, initiated by Liam Daltun (his most constructive contribution to the ongoing struggle) with the aid of the IMG, but bringing in other leftists of all and no organisational affiliations. This was to oppose Frank’s extradition. We set up the Dublin Committee on the same basis for frank’s trial here, and continued the struggle for Sean Morrissey and Joe Dillon. We were successful and our success set a precedent for the Murray campaign later. All these contributed to what we must hope is the final ending of capital punishment in Ireland.